Parents with young kids in their home often think to get things childproofed, with baby gates on stairs, locks on cabinets, and covers on electrical outlets. If you have a pet in the home, you may be overlooking a common hidden danger to your child's health and safety. Even if you think about dog bites, cat bites, and dog allergies, many parents forget that dry pet food is a choking hazard to their infants, toddlers, and preschool-age children. 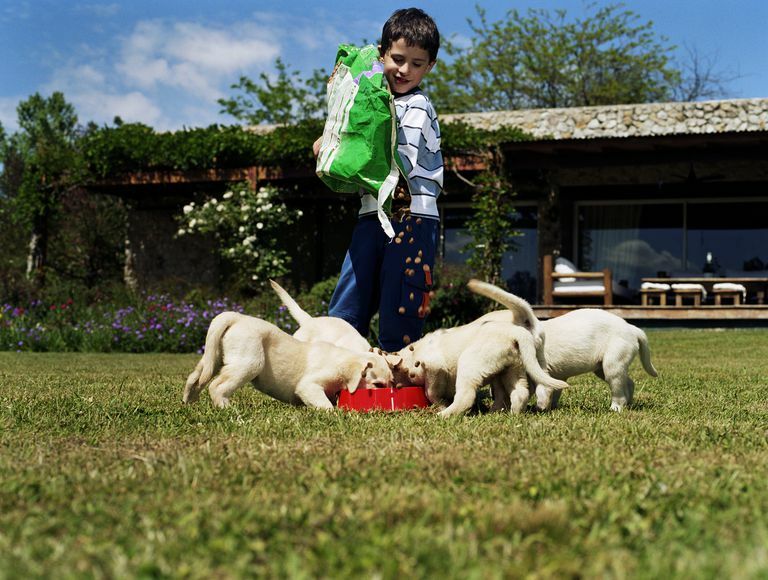 Dry pet food, especially dog food, is a choking hazard for young children. Like coins, magnets, hard candy, and toys with small parts, dry pet food should be kept away from infants, toddlers, and younger preschool age children. That means that simply putting a bowl on the floor filled with pet food would not be a good idea since your child could easily get to it. Instead, feed your pet in a childproofed room of the house. In addition to the obvious choking hazard of dry pet food, there is a more hidden hazard that parents may not be aware of — the recall of pet food because of contamination with Salmonella. According to the CDC, as of October 2008, there have been 79 cases of Salmonella infections in 21 states from the contaminated dog and cat food. And most involve young children, with a median age of infection of only 3 years of age. Many developed Salmonella symptoms, including bloody diarrhea, fever, nausea, and cramping abdominal pain. One Salmonella outbreak related to dry pet food has gotten at least 14 people sick in 9 states and may be linked to multiple brands of dry pet food produced by Diamond Pet Foods. Of course, that is not to say that they are getting sick by actually eating pet food. The source of contamination is likely just touching the contaminated pet food and then eating something else before washing their hands or simply putting their fingers in their mouth. Or your pet could have become sick from eating the contaminated food and then you got sick from touching your pet. Also, to keep both your family and pet safe, monitor the FDA for recalls and safety alerts about pet food. So what should you do if your infant or toddler eats dog food or cat food? Since one of the biggest hazards is choking, you should first make sure that your child is breathing well without any difficulty. Seek immediate medical attention if you think he might be choking, which most likely includes calling 911. Observe your child for symptoms and see your pediatrician if your child develops vomiting, diarrhea, or a stomachache, etc. And work to make sure it doesn't happen again by following some of the pet food safety rules above. CDC. Update: Recall of Dry Dog and Cat Food Products Associated with Human Salmonella Schwarzengrund Infections -- United States, 2008.